Russian bee early season management is not like any other bee breed. The winter cluster is the size of a large grapefruit compared to other species the size of a basketball. Spring build up will start with as few as two frames of brood yet still yield a sufficient honey crop by the end of the season. Brood build up is tied to natural pollen production. A strong nectar flow without much pollen will not stimulate production. 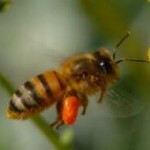 An ample balance of pollen, nectar and sugar will quickly speed development. Prevent a swarm by staying at least 1/2 super or 4 frames ahead of expansion requirements. Russian bees do not swarm according to a date set on the calendar. The key to predicting when a swarm is most likely to occur is to watch the bloom times. Swarming will occur within a window of time that is after the dandelions and fruit trees have finished blooming and before the Basswood begins to bloom. Swarms may happen at other times so the beekeeper should be vigilant to maintain 10 day hive inspections. Swarms are both the instinctual and collective brain that urges a colony to divide itself. There may not be enough room in the hive for the exploding population of bees, the queen may be old and failing, and/or a swarm is simply triggered by the time of year. Swarms can be averted by re-queening the hive each year or by routinely removing all queen cells. It is a great advantage to the beekeeper to be prepared for a possible swarm and help the colony to divide itself under the watchful eye of the beekeeper. If splitting a hive is your intent, pull the queen out and divide the colony one week before swarm conditions are evident.